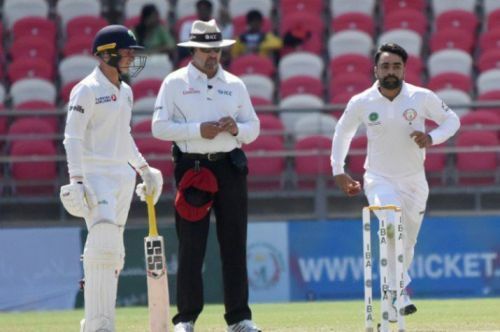 It was an historic day for Afghanistan cricket as their star bowler Rashid Khan became the first bowler from the country to achieve the distinction of picking a 5-wicket haul in a Test innings. The teen sensation ran through the Ireland middle order on the third day at the Rajiv Gandhi International Stadium, Dehradun on Saturday. Afghanistan had played their maiden Test match against India last year. Rashid looked nervous in his debut match, returning figures of 2/154 in 35.2 overs. Afghanistan lost the match by an innings and 262 runs. In the ongoing Test match against Ireland, Rashid took 2 for 20 in the first innings which helped bowl out Ireland for 172. Afghanistan scored 314 runs in their 1st innings to take a 142-run lead. Ireland looked in good position at 141 for 3 when Rashid stepped up to the crease and started working his magic. He ensnared the wickets of McCollum, Kevin O'Brien, Thomspon, Dockrell and McBrine to finish with figures of 5 for 82 in 34 overs. Afghanistan were 29 for 1 at the end of day 3. They need another 118 runs to register their first ever Test win. Rashid has been simply sensational in international cricket for Afghanistan. He is currently the sixth-highest wicket-taker in T20I cricket with 75 wickets, and he also has 123 wickets in ODIs. Rashid's stature as a bowler has grown exponentially in limited overs format. He can change the course of the game with his control and variations, and can trouble even the best of batsmen. Rashid has played for various franchises around the world in the T20 format. He is a prominent member of leagues like CPL, BBL, APL and the Natwest T20 Blast. He has been retained by the Sunrisers Hyderabad franchise for this year’s edition of the IPL. Rashid would be hoping to weave his magic once again and help SRH win their 2nd title.